President Muhammadu yesterday stated that it would take a decade of government attention to reverse the damage to environments in parts of the Niger Delta region. Receiving members of the Institute of Chartered Accountants of Nigeria (ICAN) at the presidential villa, Abuja, President Buhari noted that although the Federal Government has taken steps to clean degraded areas in the region, the means of livelihood of farmers and fishermen in the Niger Delta has since been destroyed. Its President, Razak Jayeola led the ICAN delegation to the villa, after the recently concluded 48th Annual Accountants’ Conference. According to the President, a full assessment of the environmental issues in the region has since been carried out. “Our assessments have shown it will take decades to reverse this damage. But we have made a start. With or without international cooperation, we are starting to clean up the degraded areas, beginning with Ogoni,” Buhari said. President Buhari who recalled the recent clashes between farmers and herders in the North Central region, said the country was experiencing significant increase in farmer/herdsmen clashes, as a result of the environmental crises. “This trend, which is recurring in many West and Central African nations is as a result of desertification. “We are also seeing unpredictable rain patterns resulting in significant floods across our riverine communities. These floods have destroyed hundreds of homes and farmlands. “We have also introduced policies that are improving the business environment. We have implemented projects that enable young entrepreneurs. We will also continue to review obsolete laws that are hindering growth in many sectors,” he noted. President Buhari therefore challenged ICAN members to take it as a responsibility to ensure that their clients, in both the public and private sector, prioritize environmental sustainability in their operations. In a related development, President Buhari yesterday said his administration would work harder to improve on the gains recorded in securing the country from the onslaughts of terrorists and criminals, and ensuring that Nigerians enjoy a better livelihood by stabilizing the economy. Hosting Tijjaniyya Shura Council, the President assured that government would continue to review its interventions and projections on security and the economy, with the hope of bringing peace and improved economy to all. 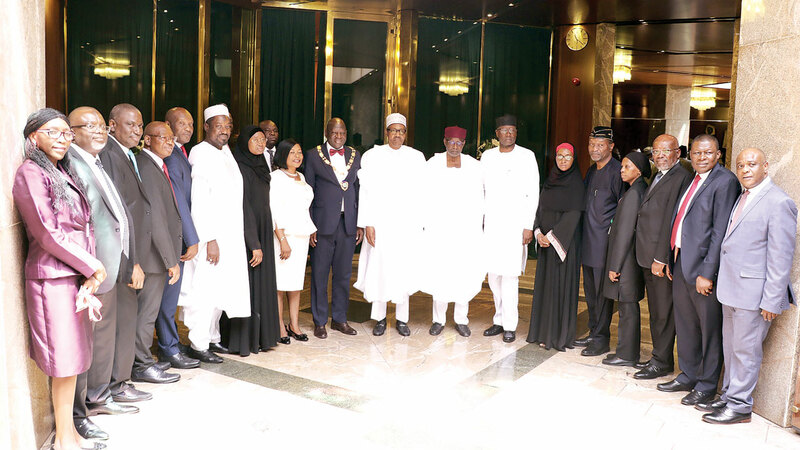 President Buhari commended religious bodies and Nigerians for the encouragement shown to the administration through prayers, pointing out that a peaceful and prosperous country is realisable with collective vision and shared effort. Shiekh Maihula said peace and economic prosperity were not negotiable for the unity of the country, urging the president to remain focused and steadfast in pursuing the policies he had outlined.